Local/State News - Moore County Democratic Party - Be Part of the Process! Beasley has been appointed to the judiciary by three different Governors – the District Court bench in Cumberland County by Gov. Jim Hunt, the Supreme Court by Gov. 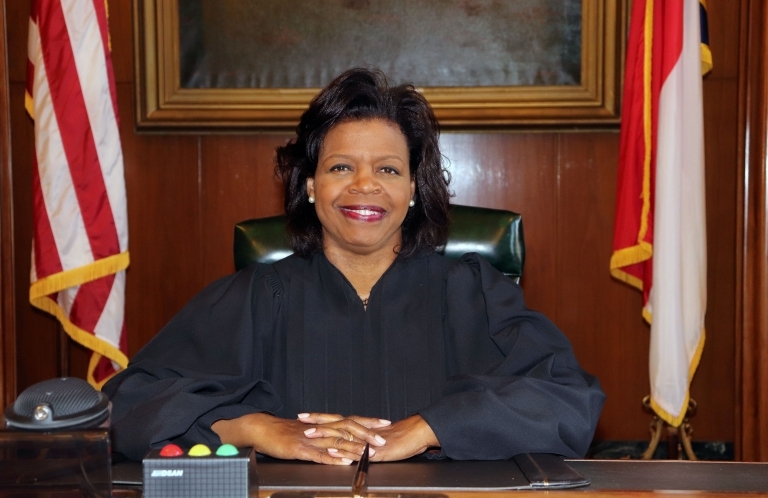 Bev Perdue and now the Chief Justice post by Cooper. She also served on the state Court of Appeals, where she was the first Black woman to be elected to statewide office without having first been appointed by a Governor. In its history, 95 justices have served on the Supreme Court. Of that number, only seven have been people of color and only one of those seven – Henry Frye – has served as long as a full term of eight years. It’s not expected that much will change under her leadership. The other justices, she said, are always committed to working hard and to properly resolving cases in a timely fashion. The Chief Justice, though, is responsible for much more than just the work of the high court. They are the leader of the entire judicial system with broad responsibilities, including numerous administrative and appointment duties, designating the Chief Judge of the Court of Appeals, creating Superior Court sessions and assigning those judges and choosing three-judge panels that hear constitutional challenges. Beasley does not believe partisan politics has any place in the work justices perform on the Supreme Court. Beasley’s appointment to serve as Chief Justice leaves her current position vacant, and Cooper will also appoint someone to fill it. His decision, which he expects to announce in the next week or so, could change the court to a 6-1 Democratic majority. He’s been asked if he feels any obligation to appoint a Republican to keep a balance on the bench, but said he will appoint the best person for the job, whomever that may be. Beasley has been invested in working with kids and mentoring and training young lawyers, which she hopes to continue as Chief Justice. She wants people to see how big their possibilities in life can be. “That’s why I think it’s so important and incumbent on the rest of us to help young people to see that the possibilities really are endless, and that so much in our future, and really in our present, depends on their willingness to see that they really are very capable and will offer the hope for North Carolina,” she added. Round-up: NC General Assembly discusses four constitutional amendments — hunting and fishing, voter ID, victims’ rights, legislative appointment of judges. GOP lawmakers want North Carolinians to make sweeping, permanent changes to the state Constitution and trust them to sort out the details of it all later. The legislature considered four constitutional amendment proposals yesterday and voted to move along two of them and continue discussing the other two. 1. The House Rules Committee voted first along party lines to pass a constitutional amendment that would protect people’s right to hunt, fish and harvest wildlife. There was no debate. 2. An amendment to enshrine a voter identification requirement for in-person voting in North Carolina. The details of how North Carolina’s voter identification process would not be decided until after voters approved the amendment, which technically means lawmakers could resurrect the same “monster voting law” they did before that was struck down by the courts. •Tomas Lopez, Executive Director of Democracy NC, a voting rights organization, echoed some of Spearman’s sentiments and expounded on the gravity of having a constitutional amendment on a voter identification requirement. Paula Jennings, who represents the League of Women Voters of Wake County, said the organization strongly opposes a voter ID amendment. •Other members of the public spoke in favor of the amendment, recounting personal experiences with voter fraud and calling for more security. •It should be noted that the State Board of Elections released an audit of the 2016 election and found that only one of the 4,769,640 votes cast in November would probably have been avoided with a voter ID law. 1. The first is a version of Marsy’s Law, which is a multi-part proposal to expand crime victims’ rights. On the surface, it sounds simple, but Senate debate proved it’s anything but. Sen. Tamara Barringer (R-Wake) championed the bill and said the most important provisions involved the expansion of notification to victims of crime about proceedings and outcomes, the expansion of the definition of victim and an enforcement mechanism for victims to file motions in cases when they’re dissatisfied. But, Democratic Senators had a lot of questions, including how notification and a victims’ right to be heard would be implemented in bond reduction hearings, how courts could manage inappropriate victim responses when they have a constitutional right to be heard and how much money would be involved. Wake County District Attorney Lorrin Freeman said the state Conference of District Attorneys had been consulted about the amendment process and provided feedback up to the day before the meeting. But, she said a lot of what the amendment does is already in place — victims’ rights already are enshrined in North Carolina Constitution. The Committee did not vote on the amendment, but expects to take it up again Monday. 2. The last constitutional amendment discussed was one sprung on the legislature the day before by Senate President Pro Tem Phil Berger. The Judicial Vacancy Sunshine Amendment — sponsored by Senators Warren Daniel (R-Burke), Paul Newton (R-Cabarrus) and Shirley Randleman (R-Stokes) — would transfer judicial vacancy appointment power from the governor to the legislature. The enabling legislation that comes after the constitutional amendment is passed could result in the legislature choosing seven of the nine-member commission and the governor and state Supreme Court Chief Justice each choosing one member. All of the members could be from one party or the other. And lawmakers would not be bound to choose anyone the commission picks. Again, the Senate Committee did not vote on the amendment, but discussion will continue Monday.